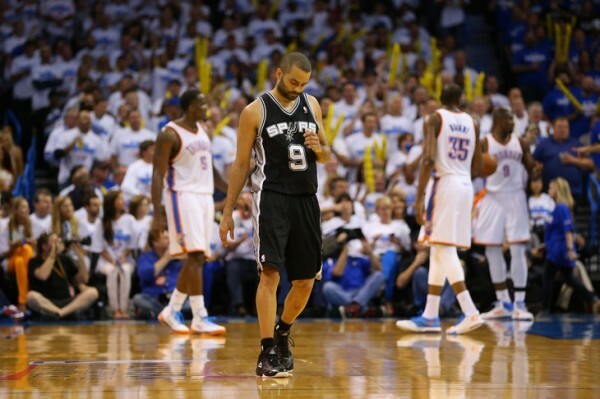 It’s now or never for the San Antonio Spurs to stop the landslide that began with Serge Iabaka returning and has caught everyone on the Oklahoma City Thunder on fire, including Russell Westbrook and Kevin Durant, as the 2-2 tie in the Western Conference Finals will be broken, with the winner very likely to take the series eventually. The return of Serge Ibaka has turned this series completely on its head. From the San Antonio Spurs’ offense being too much for the Thunder to keep up with we’ve gotten a group of well trained but lost-looking players, finding it difficult to get easy points in the paint, can’t create any easy transition points and their 3-point shooting, maybe the most important part of the Spurs’ offense, simply isn’t falling down, finding it hard to get open shots. There’s nothing too planned or brilliant about the Thunder’s offense, but with the kind of pressure they’re creating on defense, it doesn’t matter. They’re getting plenty of fast break looks through the incredible pressure Russell Westbrook is putting on the Spurs’ ball handlers, resulting in Westbrook scoring 40 points in the previous game, half of them coming on possessions when he is the only Thunder player to touch the ball. Kevin Durant is enjoying the Spurs’ defense falling apart. He did make a few tough shots, but with the Spurs forced to scramble and protect the interior differently than before, Kawhi Leonard can’t keep Durant getting balls very far away from the basket, making things far too easy for the best scorer in the NBA, finishing with 31 points in the previous game. Gregg Popovich needs to find answers, and telling his players to keep up the pace and keep up the movement isn’t doing the trick it seems. Popovich himself needs to think of something because it looks as if most of his players have been struck by the fear factor of the rising Thunder, remembering how it all ended in 2012, with the Thunder winning four games in a row after losing in the first two. Popovich might be the best head coach in the NBA, but it’s never too late to learn from others. The Thunder’s strength is their defense and crowding the paint with Ibaka alongside Perkins or Steven Adams. Using small ball effectively forces Scott Brooks to pull out one of his big players, with the Thunder being a lot less efficient defensively when playing with smaller lineups, which obviously creates less easy shots for them on offense. There are other factors to consider – back on the home court where shots suddenly drop (the Spurs missed a lot of open shots in the two losses from deep) and also getting the officials to swing their way. It might not be classy or gentleman like to speak about referees, but they decide games and series as much as players and coaches do, and the Spurs need to hope that being on the receiving end of that treatment in the two OKC games will change back in Texas, proving to be in their favor.